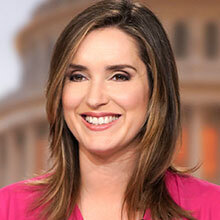 Margaret Brennan is moderator of CBS News’ “Face The Nation” and CBS News’ senior foreign affairs correspondent based in Washington, D.C.
Brennan has reported on politics, international affairs, and global markets since 2002. She joined CBS News in 2012 and was named White House and senior foreign affairs in 2017. Since 2012, Brennan has been based in Washington and has reported on the Trump administration, and previously President Obama’s administration, for all CBS News programs. Previously, Brennan covered the State Department for four years, where she reported on major national security stories including nuclear negotiations with Iran; restoration of diplomatic ties with Cuba; the standoff with North Korea; the conflict in Ukraine; and the accord to transfer control of Syria’s chemical weapons. Brennan is a term member at the Council on Foreign Relations and sits on the Advisory Board for the University of Virginia School of Politics. Brennan graduated with highest distinction from the University of Virginia in 2002, where she earned a Bachelor’s degree in Foreign Affairs and Middle East Studies with a minor in Arabic. As a Fulbright-Hays Scholar, she studied Arabic at Yarmouk University in Irbid, Jordan. She is also the recipient of an honorary doctor of letters degree from Niagara University. Brennan is a Connecticut native.